LOCATION.--Lat 42°40'55", long 77°49'44" referenced to North American Datum of 1983, Livingston County, NY, Hydrologic Unit 04130002, on left bank 290 feet upstream from bridge on State Highway 36, at Sonyea. PERIOD OF RECORD.--March 1911 to December 1913 (published as "at Sonyea"), September 1915 to December 1916 (published as "near Sonyea") seasonal records only. August 1917 to September 1932, November 1974 to September 1977, April 2016 to current year. Occasional discharge measurements, water years, 1954, 1957-62,1964, and 1965. REVISIONS HISTORY.--WDR NY-75-1: Drainage area. GAGE.--Water-stage recorder. Datum of gage is 580 ft above NAVD of 1988, from topographic map. 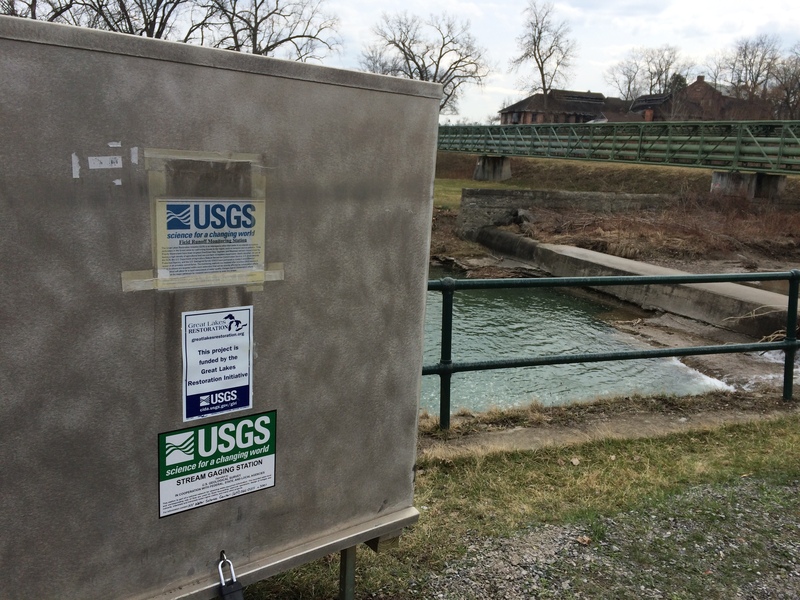 Prior to April 2016, water-stage recorder at site 400 ft upstream at different datum. Prior to Sept. 30, 1932, nonrecording gages at different sites and datum. COOPERATION.--In cooperation with the U.S. Environmental Protection Agency's Great Lakes Restoration Initiative (GLRI) and New York State Department of Corrections and Community Supervision. REMARKS.--Water Years 2016-17: Records fair except those for estimated daily discharges, which are poor. EXTREMES FOR PERIOD OF RECORD.--Maximum discharge, 6,280 ft³/s Sept. 25, 1977, gage height 6.69 ft, site and datum then in use; minimum discharge, about 0.1 ft³/s Sept. 8-21, 1932, at site then in use. PERIOD OF DAILY RECORD1.--WATER TEMPERATURE: April 2016 to current year. SPECIFIC CONDUCTANCE: April 2016 to current year. pH: April 2016 to current year. DISSOLVED OXYGEN: April 2016 to current year. TURBIDITY: April 2016 to current year. INSTRUMENTATION1.--Multi-parameter water-quality sonde measures water temperature, specific conductance, pH, dissolved oxygen, and turbidity at 15-minute intervals since April 2016. EXTREMES FOR PERIOD OF DAILY RECORD1.--WATER TEMPERATURE: Maximum, 29.7°C, Aug. 13, 2016; minimum, 0.0°C, on many days during winter. SPECIFIC CONDUCTANCE: Maximum, 604 uS/cm @ 25°C, Nov. 23, 2016; minimum, 168 uS/cm @ 25°C, Apr. 20, 2017. pH: Maximum, 8.7 , May 11, 12, 2017; minimum, 7.6, Jun. 15,16, 2017. DISSOLVED OXYGEN: Maximum, 15.3 mg/L, Mar. 13, 2017; minimum, 6.2 mg/L, Aug. 5, 6, 13, 2016. TURBIDITY: Maximum, 3770 FNU, June 15, 2017; minimum, 0.1 FNU, on many days in 2017.